Sunday, October 12th: For some reason I woke up very early. It was just before 6 AM. The moon had set and it was still dark. I don’t know if it was the sound of a zipper on Bruce’s tent, or the scrunching sound Alan’s mattress makes when he rolls over. Or maybe I had just had enough sleep. I decided to get up. Without getting out of my sleeping bag, I laid out the clothes I would wear and piece by piece pulled off the warm things I had worn to sleep in and replaced them with the cold pieces from my dry bag; first the long sleeved shirt, then the first of two polartec sweaters. Finally I pulled long pants on over the longjohn bottoms I’d been sleeping in. The final touch was my waterproof socks for use with my keen sandals, and a stocking cap. I grabbed a waterproof windbreaker and my headlamp, unzipped the tent and climbed out into the pre-dawn darkness. 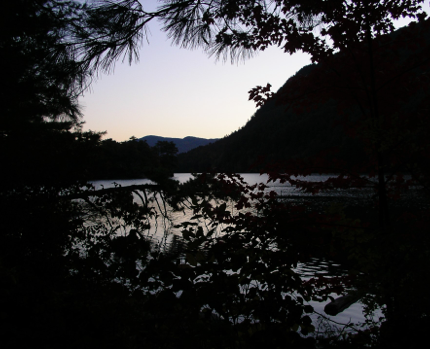 Walking quietly to the lake’s edge, I took in the dark outlines of the land across from St. Sacrament Island. I stared intently. Somehow, I always expect to see large animals this early in the morning, but I never do. This morning I saw nothing as usual. The only sound was the call of a solitary bird. Coffee by the water while watching the sunrise seemed like a good idea. I went to my boat and got out the Jetboil stove, a water bag and the dry bag that held breakfast, the coffee and coffee fixings. I sat down on the dock that was now on the shore, assembled the stove and poured in some water. Soon the Jetboil was blasting away, making a sound in the morning stillness that seemed louder than a jet engine warming up for takeoff. In just a few minutes the water was bubbling furiously. I turned off the stove and spooned in enough grounds to make two good strong cups. Once the lid was on, I could again turn my attention toward the dawn brightening the eastern sky. My camera was in my pocket. I pulled it out and shot picture after picture of the changing scene as darkness turned to light and night slipped into day. After too much time, I pushed the plunger on the Jetboil’s French press lid and poured a cup. It was strong. After a while I heard the zipper on Alan’s tent followed by his feet shuffling through the fallen leaves as he headed off in the direction of the outhouse. When he returned we quietly exchanged good mornings and he set about heating water for a cup of hot chocolate. Soon Bruce appeared from somewhere. He has a habit of rising early and walking in the morning. I offered him some coffee, which he wisely refused. Bruce has had my camp coffee before. Sometime before eight o’clock, Ruth joined us, asking for a departure time. 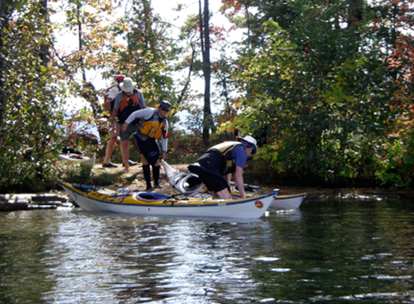 Those of us who were ending our trip today had about fifteen miles to paddle, while those who were staying for a third day would paddle twenty or more miles. It seemed wise to get a reasonably early start. We agreed to be on the water by 9:30 AM, not early, but reasonably early. eastern shore. 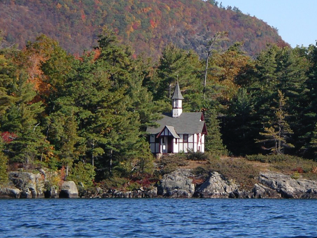 Soon we left Agnes Island behind on our right and paddled close to Sabbath Day Point, with its lovely chapel perched on rocks along the shore. 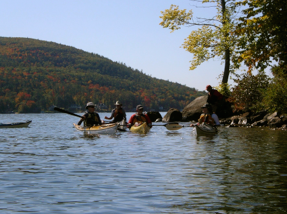 It’s named for Isaac Jogues, the French explorer who named the lake in 1642. Keeping to the western shore we passed many of the “McMansions” that are being built on the lake. The land has become so valuable that wealthy people from around the country and the world are buying up the old lakefront camps and cottages, tearing them down and building huge second homes. It’s driving the locals and long-term seasonal residents out. And these new owners are often there less than a month every year. It’s a shame. Up ahead we could see the beach that signaled our arrival at the Silver Bay Association’s property, a place where we could go ashore and relax for a few minutes. 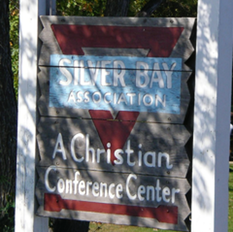 The Silver Bay Association was formed in 1900 when Luther Wishard used the area as a leadership training site for the YMCA. We beached our boats, grabbed some snacks and sat or stood around talking in the bright sunshine. Karl peeled off his Farmer John and wadded into the lake for a swim. He’s a better man than I am, because the water was sixty degrees, and probably colder. After his swim, Karl sat in the sun to dry off, while we finished our snacks. 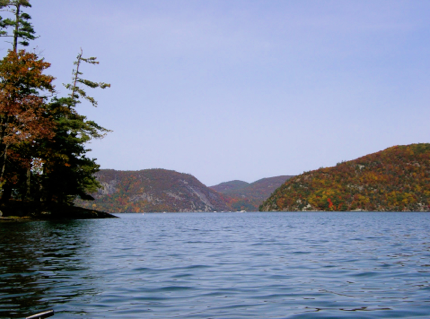 Back on the water, we rounded the point at Silver Bay and continued north along the western shore. 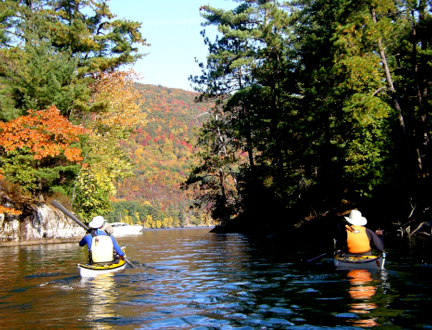 As we approached the village of Hague, we heard that deep, unmuffled roar again, as the same group of powerboats passed us, heading north toward Lake George. A mile or so past Hague are the Waltonian Islands. These islands lie close to shore in shallow water. There are not many of them, but they are pretty and it is pleasant to paddle through them. We stopped at the most northern of these, Flirtation Island, for lunch. 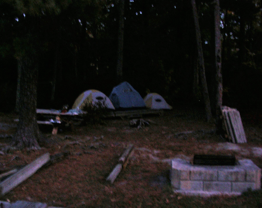 There was a campsite set up on the island, but with no one around, we weren’t invading anyone’s privacy. We pulled our boats up over a low embankment onto the grass, grabbed our food and headed for the far side of the island with a view of the eastern shore. Flirtation Island was about ten miles from last night’s camp at St Sacrament. Ruth, Frank and I would continue north to Mossy point, about five miles away, and the end of our trip, while Bruce, Alan, Phelps and Karl would head back to last night’s camp, which they had left set up. Back on the water, we paddled out of the Waltonians. 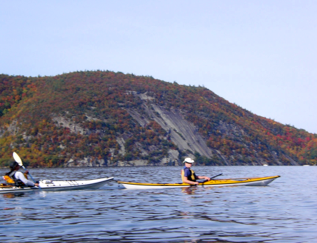 The three-day group decide to paddle north as far as Anthony’s Nose, cross to the Eastern side and head south along the eastern shore. 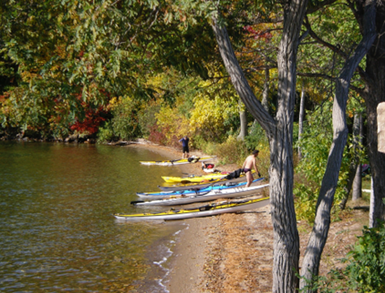 As you paddle out of the Waltonians, it appears that you are at the end of the lake. Two prominent features, Anthony’s Nose on the east and Rogers Slideon the west jut out into the lake so that from our vantage point, they overlap, making it appear that you are at the end of the lake. We said our goodbyes across from Anthony’s Nose. Ruth, Frank and I continued north while the others headed south toward their camp. We decided to head for the eastern shore where there was state land that was wooded and undeveloped. Then we heard that deep, unmuffled roar, as the cigarette boats raced south once again. One boat was moving up on the outside, passing boats one after another. He was bouncing and swerving in their wakes, at times almost blind from spray and nearly out of control. They passed us, this time closer than before. With a deafening mix of loud explosions and a high pitched whine they went by, leaving the lake churning like the inside of an agitator washer and the air heavy with half burned petrochemicals. We hoped that our friends hadn’t been caught in the middle of the lake when these boats roared through. The rest of the trip was pleasant, but uneventful. We passed the small and oddly named Prisoner’s Island. Prisoner’s Island sits just off center where the lake narrows as it nears its northern end. It is surrounded by shallow water. During the French and Indian War, several battles took place in this area. Prisoner’s Island got its name because 145 French soldiers were housed there during that war. It is said however, that the water was so shallow, prisoners regularly escaped by wading to shore. 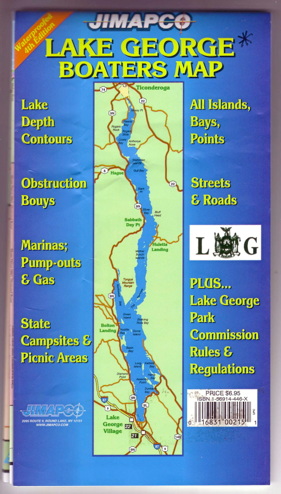 Navigating around Lake George: Jimapco makes an excellent waterproof boater’s map of Lake George. I highly recommend it to anyone boating on the lake. 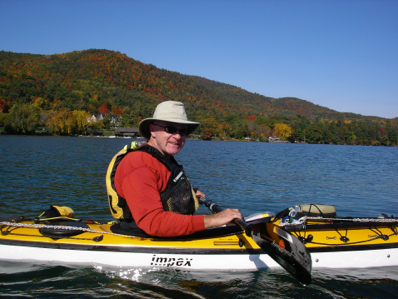 It can be purchased at many locations around Lake George, or by going to www.jimapco.com. As we neared Mossy Point, Frank sped on ahead, as he lived nearby. He planned to paddle to his house and stow his boat. He would pick up his car and head for the take-out at Mossy Point to gather Ruth, her boat and gear for transport back to her car at Million Dollar Beach in Lake George Village.